Almost 20yrs ago, a very special baby we named Campbell (Sherick’s Sweet Carolina Girl, MT) entered our lives and started it all. She had a very distinct look to her that as we fell in love with our new puppy, we undoubtedly fell in love with too. Though she was never bred, we owned her litter brother too, one of the world’s best dogs ever, named Willie (Sherick’s Sweet WM The Great). Willie was Michael’s special boy, the boy he got for himself to add some testosterone back into the girl filled house. He came to us at 8mos old. He too had a similar look. Willie hated dog shows, we never forced the issue. We didn’t care b/c he was perfect for us. On a whim, before he was neutered, b/c he was so special to us, we decided to have him collected and took him to see Stacey Toro Hathaway. In the back of my mind, b/c he wasn’t a big champion show dog (though worthy of the title had he enjoyed it), there was probably a snowball’s chance in hell it’d ever get used. Fast forward several years, after Campbell and Willie were gone,Tammy Wirth approached me about using it for her beautiful girl Dharma. We agreed. That litter produced ‘Pebbles.’ Pebbles went to live with theKocars out in WA. It has been fun to follow her and her siblings, though we didn’t take one for our own for various reasons at the time. The Kocars bred Pebbles and produced a liver/tan girl we fell in love with named Roxy. Willie’s grandbaby Roxy has been special to us and has a soft spot with us. Just before Roxy’s litter was born the day after Christmas, we found out that a very special breeding we’d planned and worked hard on to get (to Roxy’s beautiful uncle) did not work. It’s one of the more frustrating moments in ethical breeding that we hit from time to time. God has his plan through the whole thing, sometimes it’s just not clear in the moment. Yesterday it became very clear. On a 48hr round trip visit to Puyallup, WA this week, I met this very beautiful baby girl. It was afterMichael and I had pretty much decided on her that it hit me. There she was – the treasured great aunt Campbell. It’s like she was staring back at me. 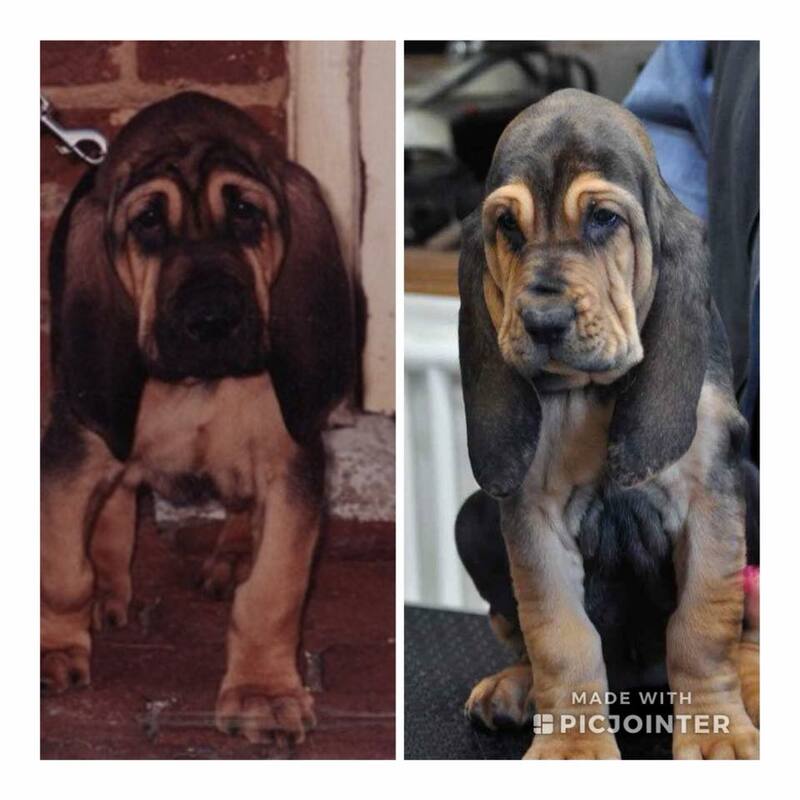 Time warped me almost two decades back in an instant to when we first laid eyes on our most beautiful baby Bloodhound coming out of her crate from Kansas that met us in RDU’s Delta cargo. Breeding, I should say ethical breeding, is full circle. It’s so special to see in generations the dogs you knew and loved come back out in the progeny. It’s what drives us onward through the highs and lows that it brings with the journey. Tina and Frank, thank you. Thank you for allowing us to bring Sterling into our lives. She not only will be part of our family, she is Michael’s next working partner. We look forward to her coming home next week! Pictured on the right is Sterling at 8 weeks old and on the left, her great Aunt Campbell also pictured at 8 weeks old.